The employment of Minchin is a perfect fit, his anarchic wit feels like something Dahl himself would have approved of but pleasingly Minchin has not dumbed down at all in his songwriting, he has simply removed the profanity. His lyrics are absolutely sensational at times: incredibly witty on multiple levels (the kids to the left of me looked over a few times as I dissolved in hysterics at humour that thankfully flew over their heads) and stuffed full of intricate but engaging wordplay which fit the occasion perfectly: the alphabetic progression of School Song being perhaps the best example of a seemingly simple conceit which is just bursting with invention. Peter Darling’s choreography worked like a dream, especially when it allowed for adults and children to dance together, I really liked the routine to opening number Miracle in that respect. Rob Howell’s design allows for maximum playing space with some lovely touches, the desks were my favourite, and his scrabble-tile-based décor paid nice homage to Quentin Blake whilst establishing its own identity for this production. Warchus has ensured that the show is full of brilliantly conceived sequences which managed to replicate some of the best moments from the story (all I will say is pigtails, and cake) in a most wonderful way. Moments of child-like wonder like the opening to the second act with the kids entering the stage down a slide and then performing a lovely song with some great movement using swings which flew out right over the heads of the audience, the final flourish as Matilda and Miss Honey leave the stage, were truly magical. But...I didn’t come out of the show thinking it was the best new musical I’ve seen in recent years as many, many people have been saying. Part of this was possibly due to the weight of expectation but it is also down to the type of musical that has been created here which didn’t quite hit my buttons as fully as I would have wanted. 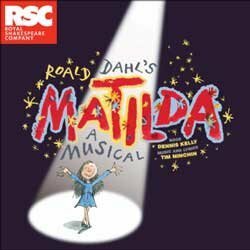 For all the lyrical brilliance of Minchin’s songs, none of them were particularly catchy or memorable and in mining the slightly unconventional path that the team do here, I was left a little disappointed that the final song wasn’t a rousing number featuring Matilda heavily or a reprise of an earlier song. This speaks more to my tastes than anything but it was a major reason why this was closer to a four star show than a five star for me.